Charlie Sheen will be charged with felony menacing in connection with the Christmas Day incident with his wife, Brooke Mueller, in Aspen ... this according to law enforcement sources. We've learned in addition to the felony, Sheen, who stars in "Two and a Half Men" will be charged with misdemeanor assault. We're told the criminal complaint will be filed either late tomorrow or first thing Monday morning. Charlie Sheen is set to appear in court Monday for an arraignment, though we're told he is not expected to enter a plea. In addition to the arraignment, the judge will hear arguments from lawyers for Brooke and Charlie to relax the protective order prohibiting any contact between the two. Charlie Sheen's lawyer had no comment. 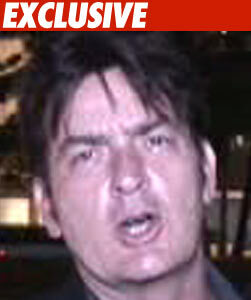 Charlie Sheen Leaves Hospital -- Brooke "Fine"